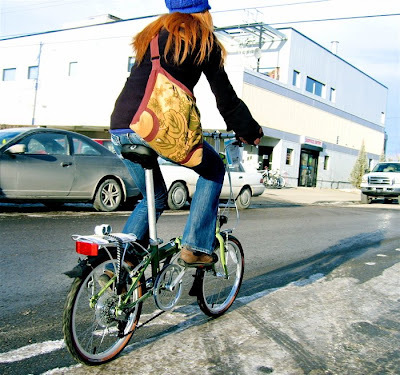 Vic from The Lazy Randonneur blog sent us this great shot of Cycle Chic in Calgary, Canada. "Here's a picture of my friend Sarah test riding Dahon folding bikes in Calgary, Alberta, Canada. She bought the pea green Dahon D7 and rides it fashionably around downtown getting to and from one fabulous moment after another. 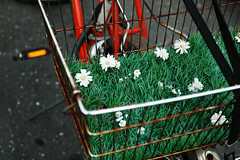 I enjoy your blog - keep up the good work... Vic"
Here's a little taste of Cycle Chic in Basel, Switzerland, by nchenga at Flickr. Basel is a great cycling city. Built on the steep banks of the Rhine it's more than hilly and yet 23% of all trips are made by bike, on a well-developed network of bike lanes. Just one of many cycling cities that disprove the "you only ride alot in Copenhagen 'cause it's flat..." myth. And this little pearl below is a great photo from Geneva, taken by Stephen. Personalising your bike in creative ways is the best part of bike culture. Thanks for posting my pic Mikael...=-) I'll be on the look out for more Cowtown Chic as things warm up in Alberta!